Last fall while I was at a conference with a bunch of farmers and ranchers, I was complaining that while we have a big back yard, the only sunny spot is where the dog does his thing, which is less than ideal for a vegetable garden. A colleague of mine from the AfroEco Group, who specializes in urban gardening, offered me this advice: "Do an upside-down garden. Take advantage of the sunny spot and keep your dog AND the squirrels away from your veggies." Throughout our lunch break, he gave me the basics. I came home enthused and throughout the winter I was pumped to start experimenting with the upside down vegetables. Gerg was game, and helped with the logistics. This photo was taken on the first day. -First, gerg made sure the house was structurally prepared for the extra weight. - We drilled holes in the bottom of the buckets. -Then we fed the plants through, roots pointing upwards. We wrapped moss around the roots to help hold the plants in place. -Finally, we filled the buckets with good soil, hung and watered them. We selected these green buckets, which were formerly pickle buckets at a local burger joint. We purchased them for $2 each. Because they were already food grade, we didn't have to worry as much about chemical residue. We scrubbed them well, and planted. This photo was taken on the 34th day. -Large, strong hooks are in order. A 5 gallon bucket full of wet soil and plant roots isn't light. -Strong, solid fascia boards are in order as well. 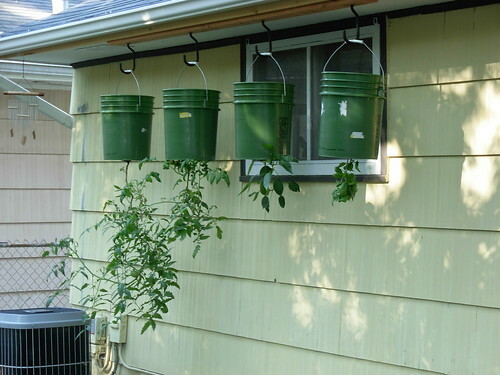 -We purchased a watering device with a longer neck, so we could water the plants while they were hanging. 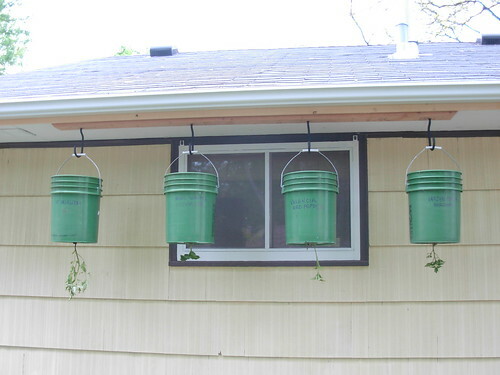 One advantage to the upside down bucket method is a lot less watering when it's dry outside. The final result was 4 productive plants: 2 tomatoes, one pepper, and one basil. Go here to see more photos of the project. Not one tomato was stolen by a squirrel. Not one. BOOYAH!